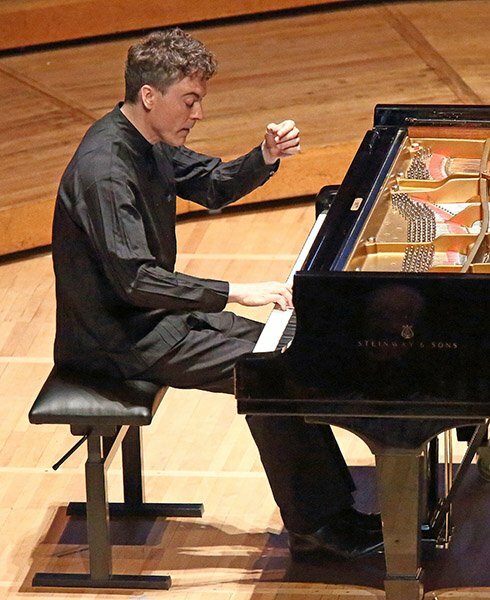 Paul Lewis shone in the limelight again on August 2nd ― this time for an Ozawa Hall recital. It turned out something akin to a jigsaw puzzle: a bunch of colorful little pieces clearly intended to form a larger view. He centered his program on Beethoven’s Bagatelles, opening with a take on Haydn’s Sonata in E-flat Major, Hob. no. 49, that was an anything but perfunctory starter. The Allegro came across well pedaled, loud and sonorous, or was it the lawn-targeted loudspeakers that were spilling over? The Adagio showcased the gifts of Lewis, the story teller, and the whole sonata transpired with richness and sophistication. The opus 119 Bagatelles continued the sonic exploration. With 11 miniatures, characterizing a wide spectrum of undisordered moods, sonority ruled. In D Major no. 3 (A l’Allemande), Lewis allowed the sequence of chords at the end to generate a messy chaos ― and to prepare a lovely contrast that came with the return of the witty first theme. In the sixth Bagatelle, the G Major Andante-Allegretto, and the most improvisational and presumably the last chronologically, the effect became most striking and unusual: instead of emphasizing wittiness of the counterpoint, Lewis delivered it as if the main goal of the piece was to explore just how rich a wall of sound the instrument can produce. Beethoven prepared the stage well for the arrival of Brahms’s Intermezzos op. 119. Brahms had been quite explicit in his explanations of the importance of new harmonies, occasionally touching on the dissonant, for his late miniatures. Lewis played the first two Intermezzi with spellbinding phrasing for which his fans know him. The third intermezzo prepared the arrival of the rhapsody, which in its turn again culminated a triumph of piano sonorities. The overarching idea of the Viennese school as a tradition of mad scientists digging into the sonorities of the piano came out quite persuasively. More Haydn began the second half, but in a totally different mood. His Sonata in B Minor, Hob. XV1: 32 started with a very crisp Allegro and finished with a relentless drive of the Presto. Closing the show with Haydn’s Sonata in G Major, Hob. XV1:40, Lewis contrasted a breathy and relaxed first movement with a driven presto, this time softened with a good pinch or humor. The single encore, Schubert’s Allegretto in C Minor, gave a brief pearly reminder of the pianist’s affinity for late Schubert, but the thoughts of the audience had already turned to the parking lots summoning little enthusiasm for more. A teaser in the handout booklet promises a multi-year relationship between Tanglewood and Lewis covering no less than piano works of Haydn, Beethoven and Brahms. On the evidence of this recital, it sounds downright mouthwatering.